Those who miss the Peabody Place bowling alley may have a new bowling alley to look forward to Downtown. One of Bass Pro’s proposed signs for the Pyramid shows a mermaid in a bikini top swimming in a fish bowl that is also a bowling ball, with bowling pins in the background, with a logo reading “Uncle Buck’s Fish Bowl and Grill.” That strongly suggests there are plans for a bowling alley in the Pyramid. The reason this sign came to light, by the way, is that some people think the sign is too risqué. Because of a bikini top? Whatever. Women have been wearing bikinis for what, 60 years now? Get over yourselves, people. View the sign and the other proposed signs here. Do you wish you could help St.Jude, but don’t have the funds to make a donation? There’s another way you can help. My BBQ team president told me recently that she gives blood at St.Jude. All the blood donated there is used by St.Jude patients. Every donation they receive helps offset the cost of having to buy whole blood or platelets from an outside source such as LifeBlood. A platelet donation saves the hospital $500-700; a whole blood donation, $250. If you’re interested in donating, here is more information. 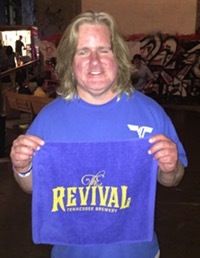 FuzzyBrew reports that local beer distributor A.S. Barboro has received its license to distribute high-alcohol beers, which in Tennessee is usually defined as beers above 6.25% ABV. Beers from Schlafly, Southern Tier, Samuel Adams, and Lazy Magnolia will be arriving in bars soon. The first high-ABV beer distributed by A.S. Barboro, Schlafly American IPA, has already landed at the Flying Saucer. The Redbirds will honor a baseball legend tonight. The first 3000 fans through the gate at AutoZone Park will receive a statue of one of the all-time greats of the St. Louis Cardinals, Stan Musial. MissUsed headlines the rooftop party on the Peabody Hotel tonight, and it seems as though the kitchen staff has seafood on their minds. Admission includes one drink ticket and a buffet of fish fingers and tater tots. Those in the VIP section will enjoy a second buffet of crab cakes with roasted red pepper sauce, chili-spiked sea bass encroute, and coconut shrimp. Party from 6-11 PM, $10 cover, ladies free before 7. Great letter from the editor this week in the Memphis Flyer. Bruce V talks about people who live in the ‘burbs who constantly criticize Memphis. A construction permit has been filed for the renovation of a building at 347 S. Front into Printer Alley’s Lofts. The building and an adjacent lot would be converted into apartments, townhomes, and retail space. One reason to move into this building, once completed, is that it will be across the street from Gus’s Fried Chicken. There’s an active Groupon for half-off a Memphis Magazine subscription. There are one-, two-, and three-year options. Pretty Woman plays at the Orpheum tonight at 7. Newsy day today. I’ll be out after work at the usual spots. It’s a celebration of IPA Day at the Flying Saucer with rotating $3 IPA Fire Sale pints all day, and since I like India Pale Ales that should be fun.